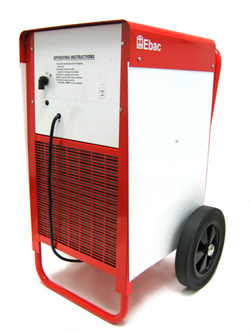 The Ebac BD150 Dehumidifier is a heavy duty, rugged and dependable unit designed for restoration work and for industrial, commercial and residential applications. The BD150 is powerful, yet small and manageable enough for transfer between sites as required. Ideal for drying out newly plastered interior walls this dehumidifier can reduce the costs of achieving this with conventional heating by as much as two thirds. The Ebac BD150 Dehumidifier is built for work in tough environments and extreme conditions. It has a heavy duty, galvanised steel chassis and casing to ensure that the unit is durable to withstand the heavy use, occasional rough handling and constant movement between sites that is part of most restoration work. The tough exterior is matched by the quality and strength of the working parts which make this a very reliable dehumidifier. The BD150 is capable of operating effectively at a wide range of temperatures. The most challenging task for a dehumidifier is to function effectively at low temperatures. Below 65°F ice formation on the condensation coils will degrade the unit's performance significantly unless it is countered. This unit is fitted with Ebac's hot gas defrost system which actively melts the ice as it forms and it is this feature which gives the BD150 its capacity for low temperature operation. With this system the BD150 is capable of operating effectively at temperatures as low as 33°F. At the other end of the temperature spectrum the highest temperature at which it will remain effective is 95°F. The Ebac BD150 dehumidifier is a powerful unit with a water extraction capacity of 67 pints per day at 80°F and 60% relative humidity. Most dehumidifier manufacturers in the US quote the extraction figure under those conditions since they are the ones specified by the Association of Home Appliance Manufacturers (AHAM) and provide a basis for fair comparison. The conditions under which a dehumidifier optimized for restoration and industrial applications works are often much more extreme and in a more demanding environment the BD150 can extract up to 27 gallons per day. This enables Ebac to recommend this unit for areas of up to 1800 sq ft. The BD150 is a remarkably compact machine for its power. Measuring just 24 x 24 x 36 inches it is small enough to be operated by a single individual and suitable for use in areas where floor space is restricted. A high capacity unit such as this will, naturally, be quite heavy and this dehumidifier weighs in at 146lb. To make manoeuvring the unit easy enough for a single operative the BD150 is fitted with two large, rugged wheels and a fold-away, integral handle. The machine is compact and light enough to be portable from site to site in a small truck and its capability for one person operation reduces operating costs. The BD150 is configured for continuous drainage which allows it to operate 24/7 without the need for permanent manning. Two versions of the unit are offered by Ebac. The BD150 provides drainage by means of a gravity feed. This requires the outlet pipe to be run to an adjacent drain or other outlet at the same level as, or lower than, the dehumidifier. For operators who require a more flexible drainage option the Ebac BD150-CR is available with an integral condensate pump which will force the condensate to an outlet that is a greater horizontal distance from the unit or at a higher level. Other applications for this unit include basements. locker rooms, storage areas and locations with moisture sensitive contents such as computer rooms, laboratories and vaults. Any area where a dependable, high capacity unit is needed and/or where extreme conditions are found will benefit from the use of the BD150.